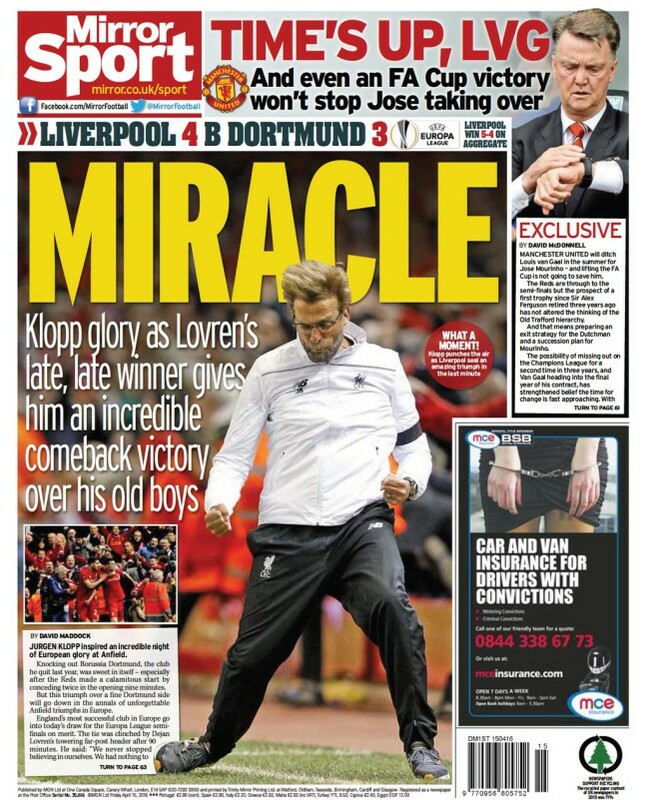 Liverpool left it late to beat Borussia Dortmund at Anfield last night. Dortmund had surged into an early lead. Henrikh Mkhitaryan and Pierre-Emerick Aubameyang scored inside the first nine minutes. Liverpool needed three goals to progress to the Europa League semi-finals. Divock Origi got one for the Read. And then Marco Reus restored the German’s advantage. 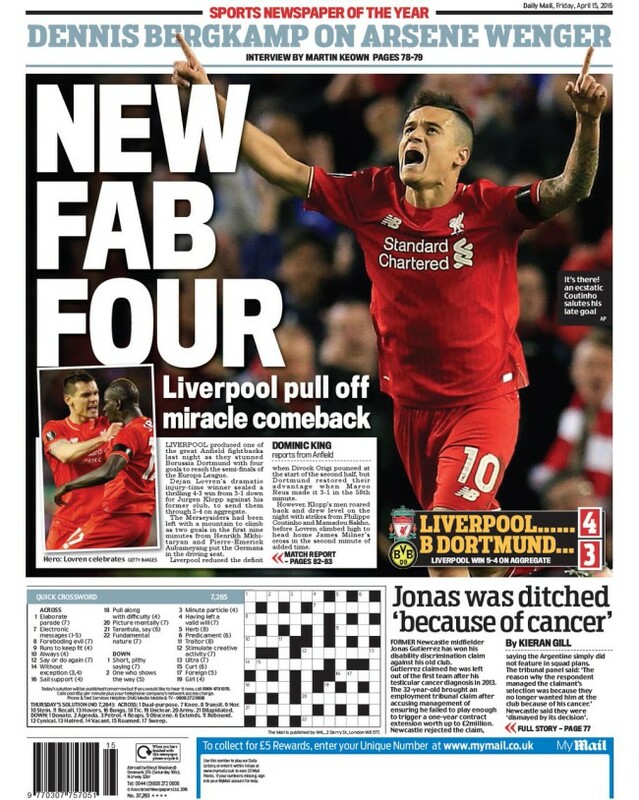 Cue Liverpool goals from Philippe Coutinho, Mamadou Sakho headed and at the death Dejan Lovren. How we interpret this tattoo is unclear. 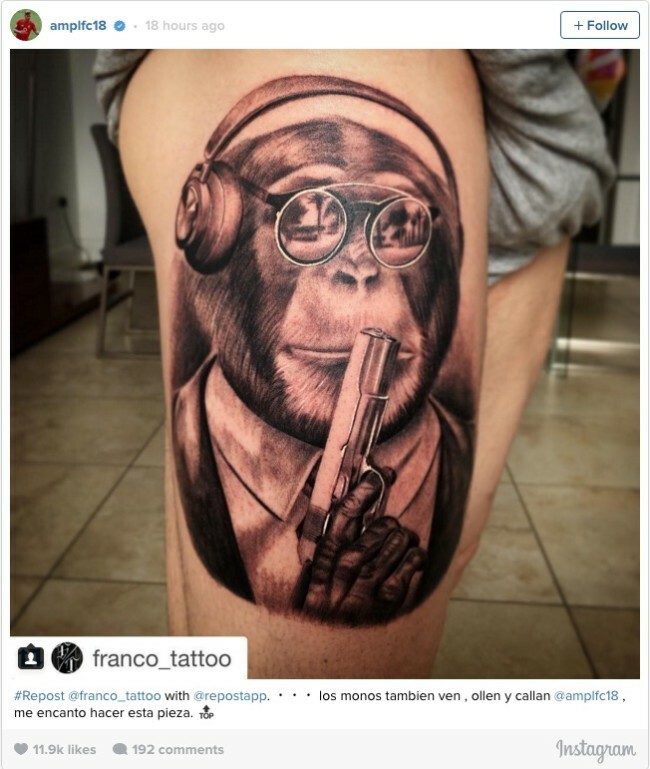 What’s the ape listening to, if anything at all – footballers often wear cans to dodge calls from fans and journalist asking for interviews. Isn Cheetah contemplating suicide, murder or a novel and dangerous way of picking his nose? Much to discuss. It’s a new angle on skin art, moving on from fat lettering, Latin scripts and numbers, and Doodled arms. 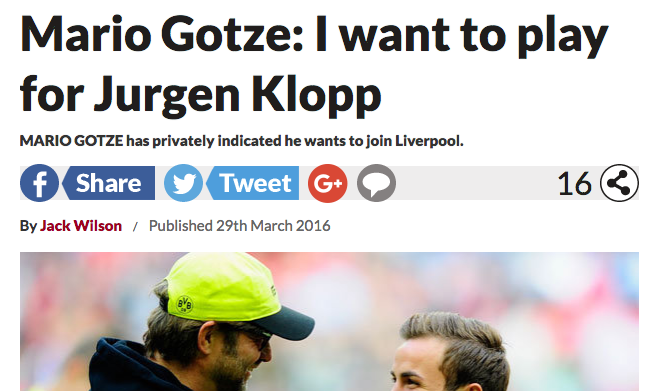 One more reason to like Jurgen Klopp, Liverpool’s charismatic manager. 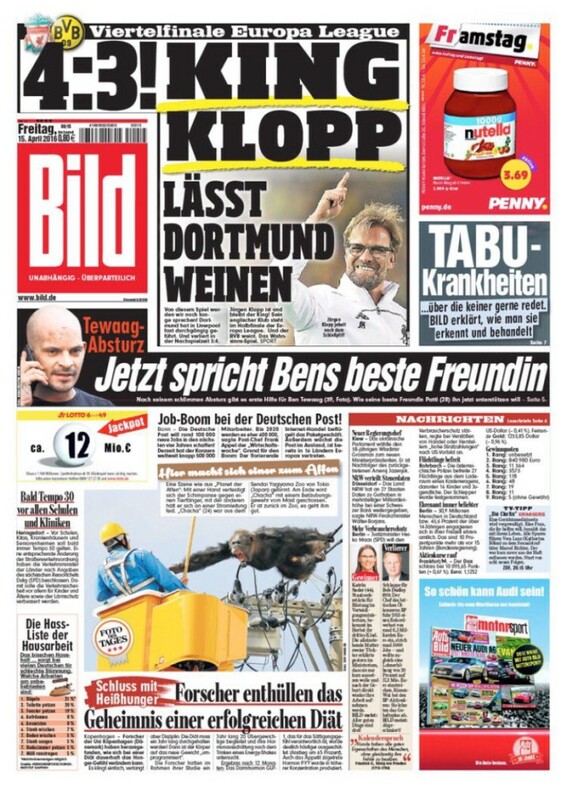 Asked if will celebrate a Liverpool goal when the Reds take on his former club, Borussia Dortmund, in tonight’s Europa League quarter-final match, the German said, “of course I will celebrate”. Good. Go nuts. Footballers who look apologetic when they score against a former club are pathetic and joyless. Goals are what the game is about. 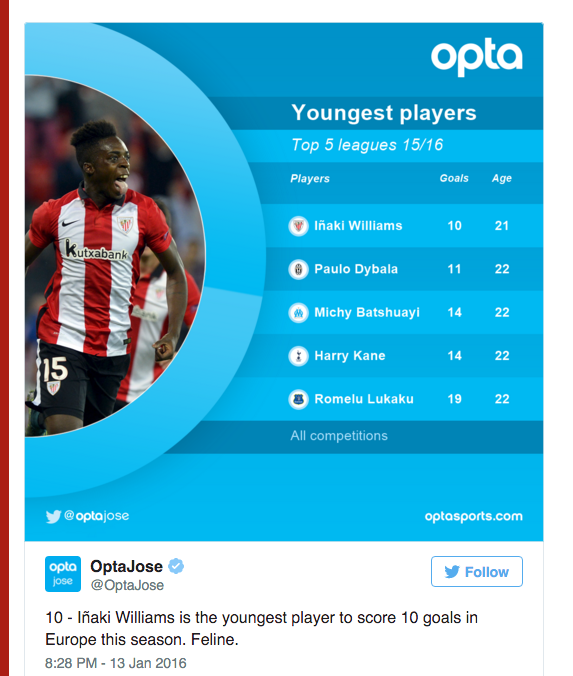 Anyone failing to celebrate them should be sent off. Are Liverpool making ready to sell Jordan Henderson? 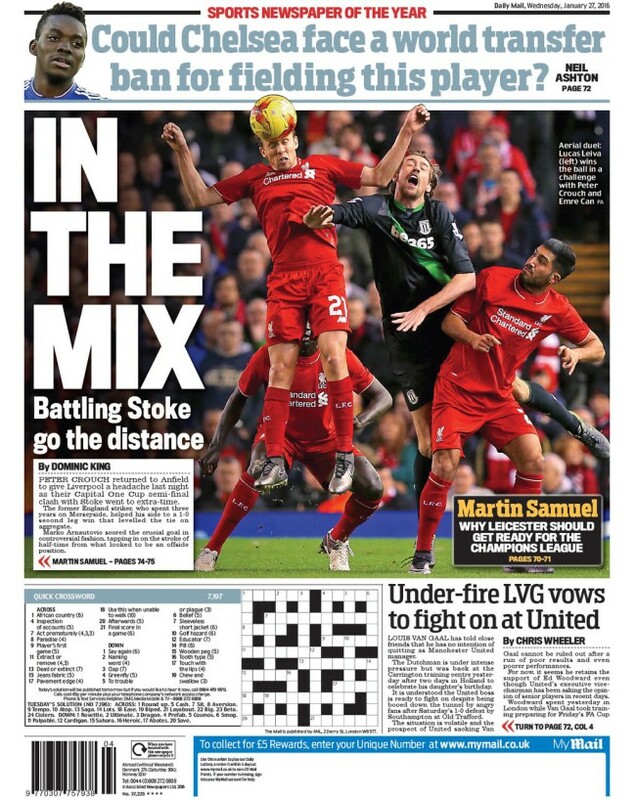 The Mail says Henderson’s sale is on the cards. 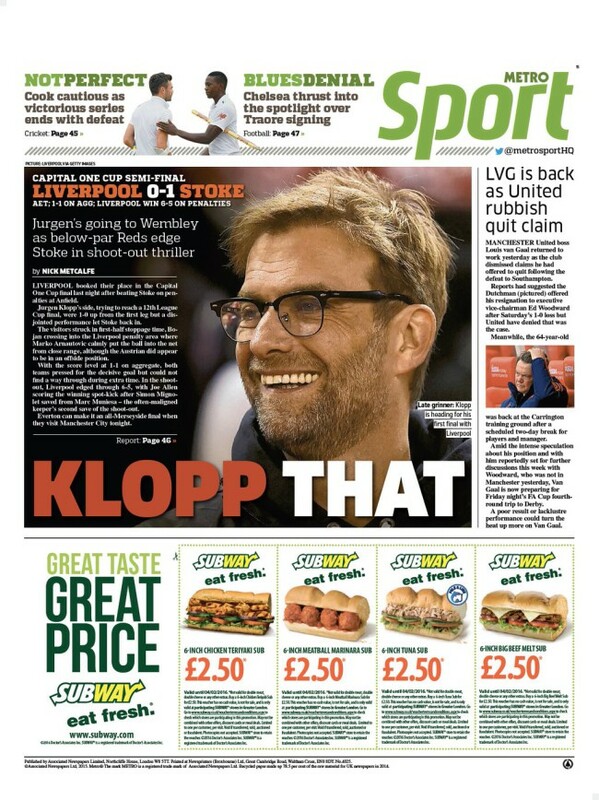 The paper says Liverpool manager Jurgen Klopp would want £20million for the former Sunderland player, with Spurs his most likely destination. Given the two clubs’ respective Premier League positions, wouldn’t a move from Liverpool to Spurs be an upgrade for Henderson? Liverpool are a mid-table side. Spurs are on the ascent. If Henderson’s future is uncertain it is only because he wants better. Manchester United will not be punished for its fans revolting chants about the Hillsborough and Heysel disasters when the club faced Liverpool in the Europa League. A Uefa spokesperson says United have no case to answer because the chanting was not mentioned in the match officials’ reports. Are some football chants just too offensive? But what’s the point of an insult if it doesn’t cause offence? The problem begins when you rule on what is and what is not permitted to be said. 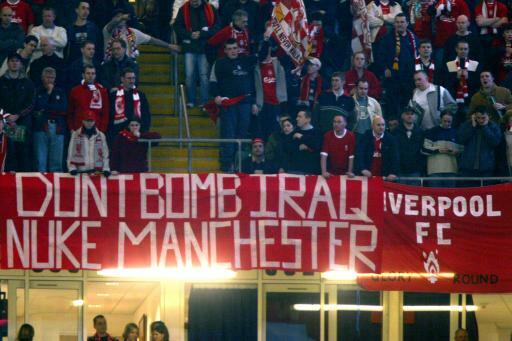 Better if it is left to United fans to tell the idiots in their number shouting “murderers” at Liverpool fans to shut up. 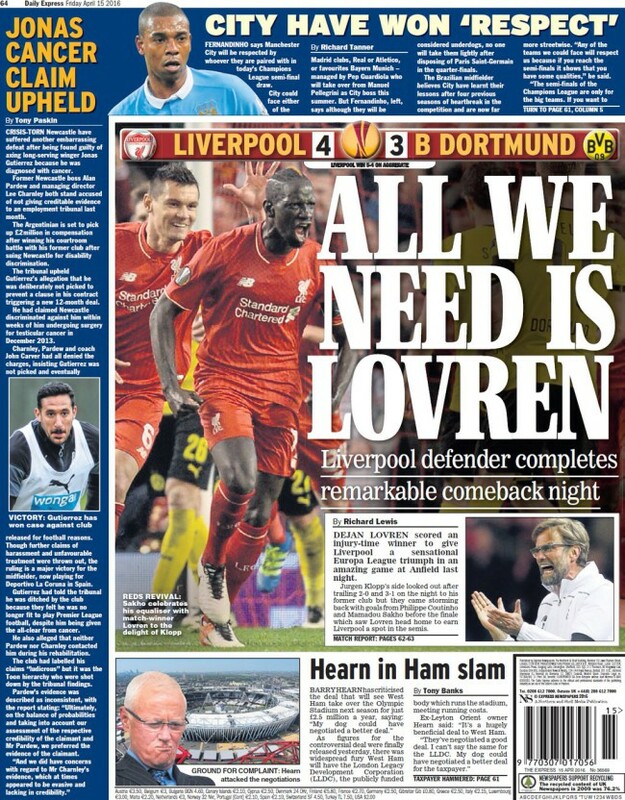 Liverpool defeat Manchester Untied 2-0 in the Europa League and the tabloids get to work. 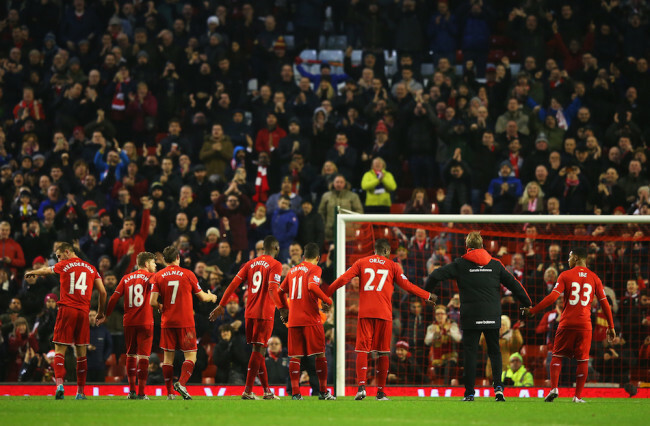 Liverpool’s first goal was scored from the penalty spot. 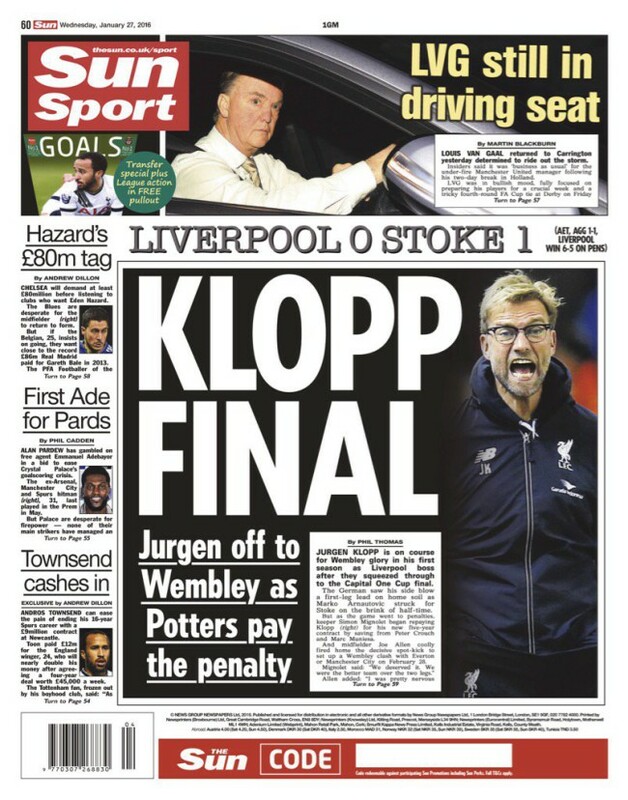 The Sun leads with this “controversial penalty”, the “second for Liverpool in four days”. 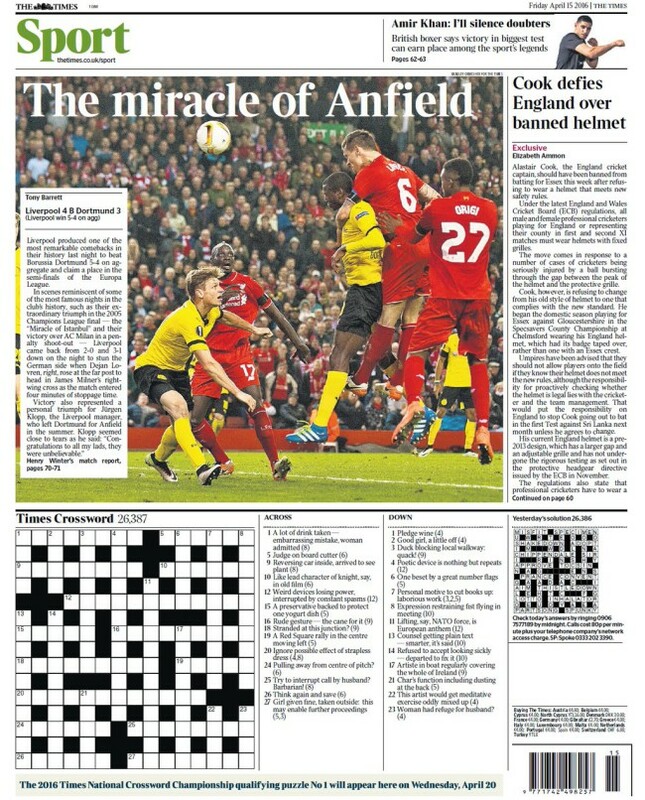 The paper reminds readers that on Saturday Christian Benteke had gone to ground easily at Crystal Palace, his tumblr helping to secure the penalty he then scored to win the game. 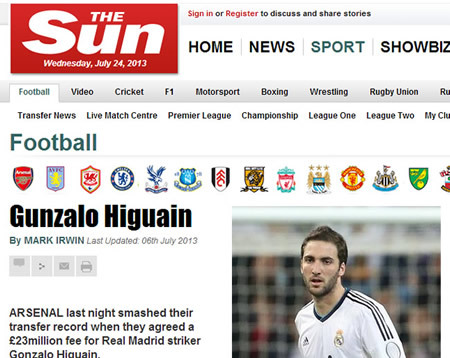 No other paper harks back to that match. 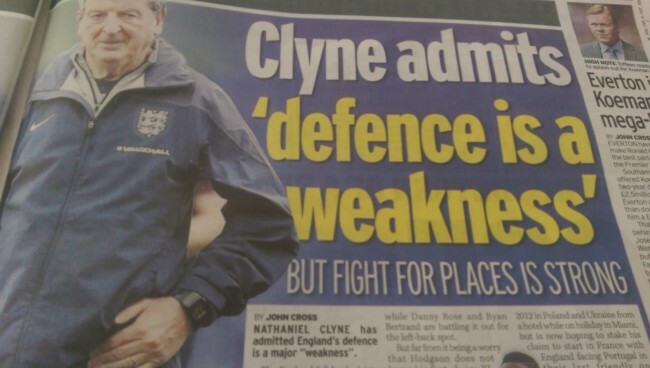 The Mirror, which unlike the Sun is read on Merseyside, says United’s Memphis Depay “brushed” over Nathaniel Clyde just inside the box. 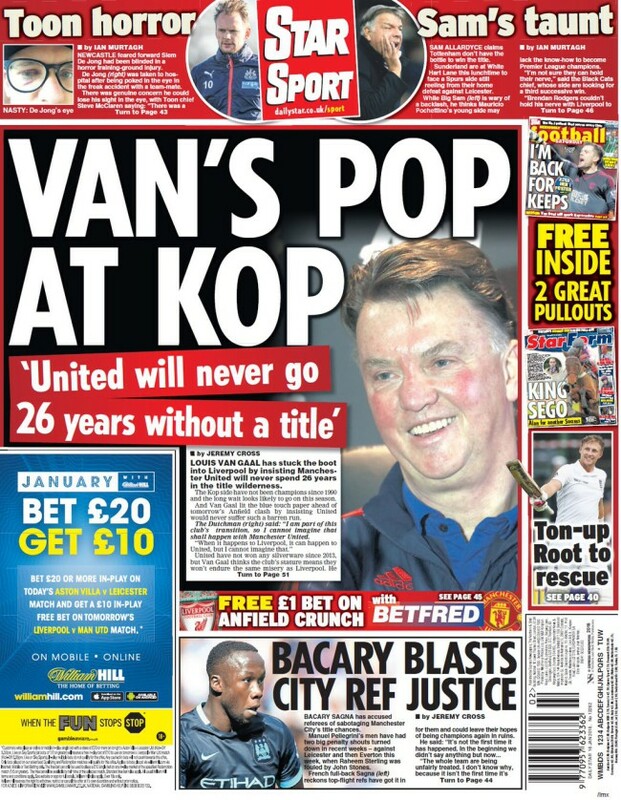 The Express says “Depay sent Clyde crashing to the turf”. The Times, the Sun’s stablemate, says “any offence bean outside the area”. Crystal Palace lose to 10-man Liverpool and there are accusations of diving. Palace manager Alan Pardew – previously seen head-butting an opposition player on the side of the pitch and verbally abusing the likes of Manuel Pellegrini and Arsene Wenger – is unhappy. Palace looked to be on course for a valuable point against a Liverpool side down to 10 men, after James Milner saw red just after the hour-mark. However, with just seconds remaining, a rash lunge from Damien Delaney in the box left Christian Benteke sprawling and ref Andre Marriner pointing to the spot. Benteke converted the resulting penalty to secure a precious win for the visitors and condemn Palace to another defeat. Hard cheese. And sour grapes. 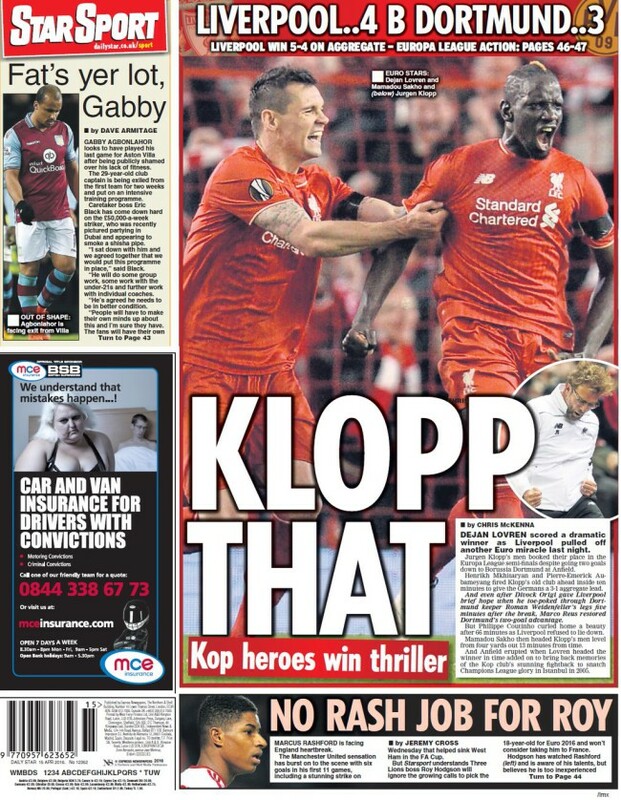 The Sun leads with news that Benteke dived to win the spot kick. 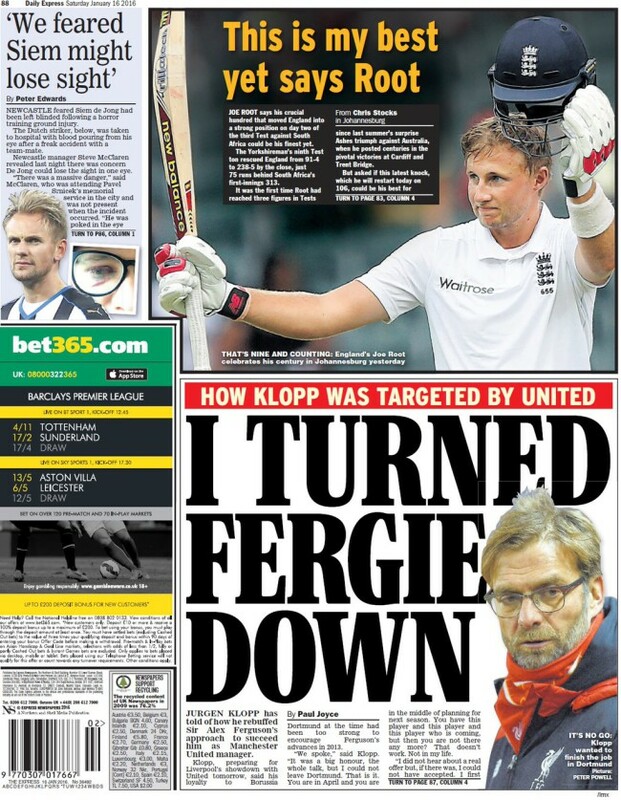 “Was it penalty to Liverpool?” the paper asks. Yes, it was. 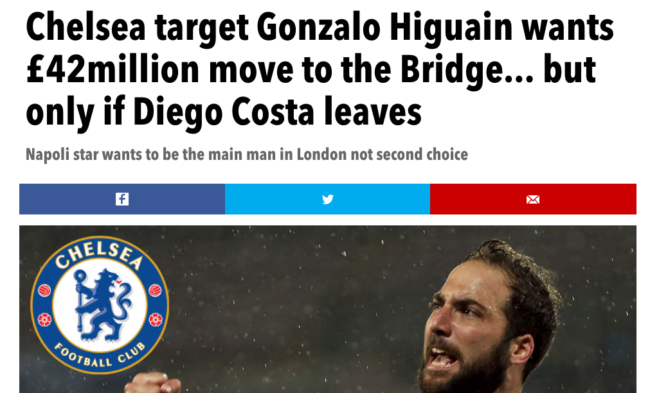 Should it have been given? Time for a heated debate. The Sun is first to respond. Paul Jiggins says “fraudulent” Benteke “conned” the officials. We then hear from the player and the Palace manager. End of. But no. 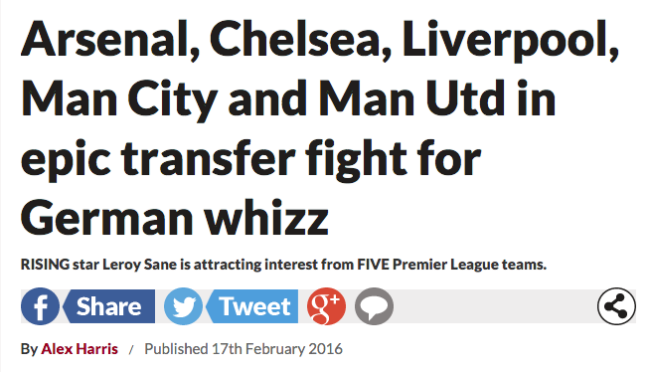 Former Liverpool player Jamie Carragher adds his opinion. But it is. In the local Press, the Croydon Guardian reports Pardew’s response is given in full. 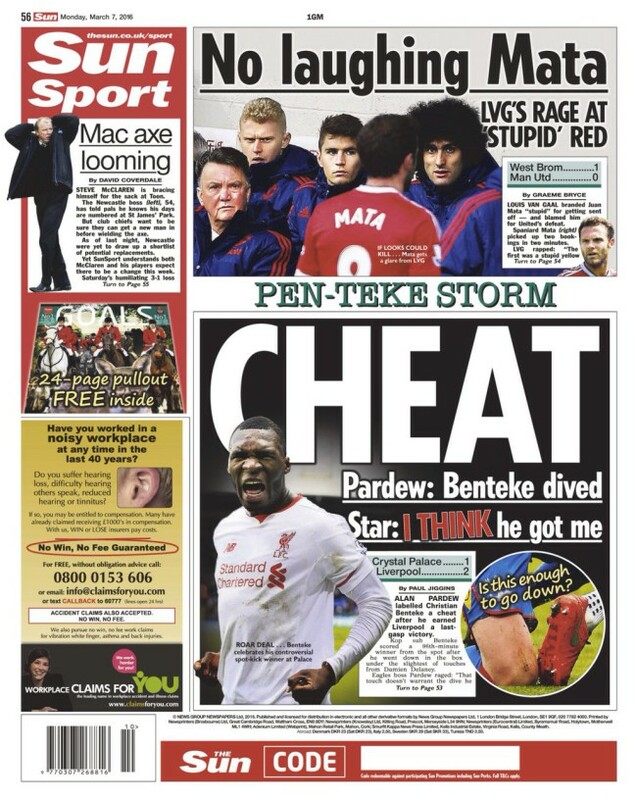 The local Palace paper calls the penalty “controversial”. 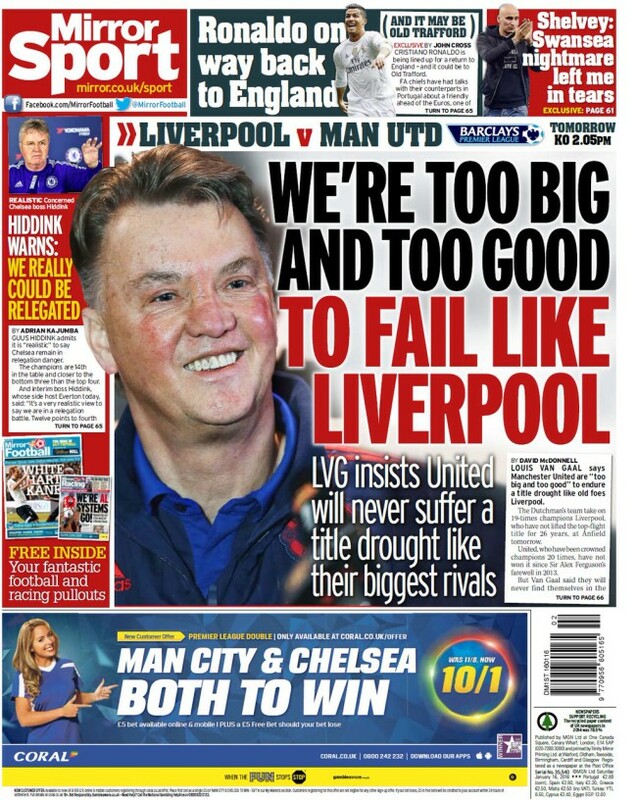 What says the Liverpool Echo? The SEObot that might well be operating Harris won’t bother to follow the link. But we will. Over there we hear from one Oriol Domenech, who says Real Madrid and Barcelona are in for Leroy Sane. Number of quotes to support his story: nil. Number of facts of any sort in either story: nil. 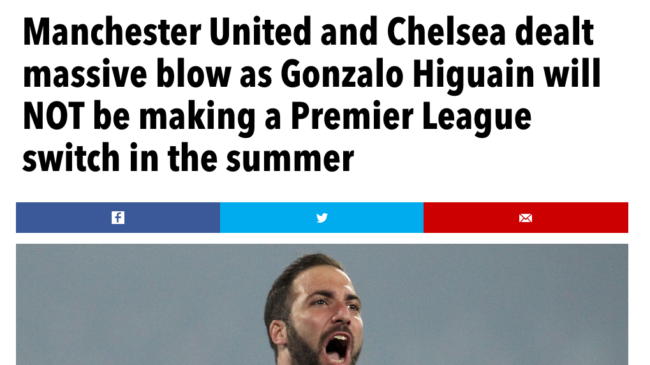 A summer move – but to where – and for how much? Two goals up against a lowly Sunderland, thousands of Liverpool fans made their way to the exists, able to feel right about making a stand and pleased to have seen the crux of a home win. Seemingly, the only losers were the fans who routinely leave early to beat the traffic – for them a 46th minute exit was the preferred route. 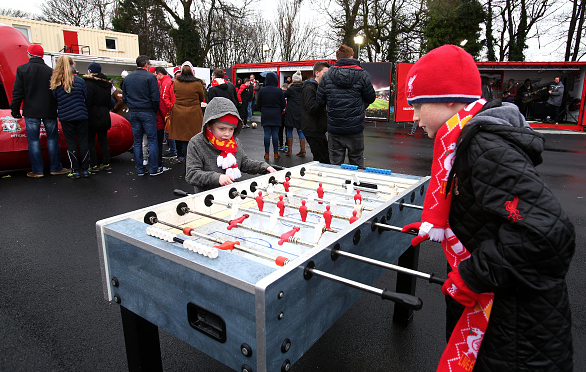 Young Liverpool supporters play at a football table prior to the Barclays Premier League match between Liverpool and Sunderland at Anfield on February 6, 2016 in Liverpool, England. PS: Liverpool boss Jurgen Klopp missed this game after suffering a suspected bout of appendicitis. 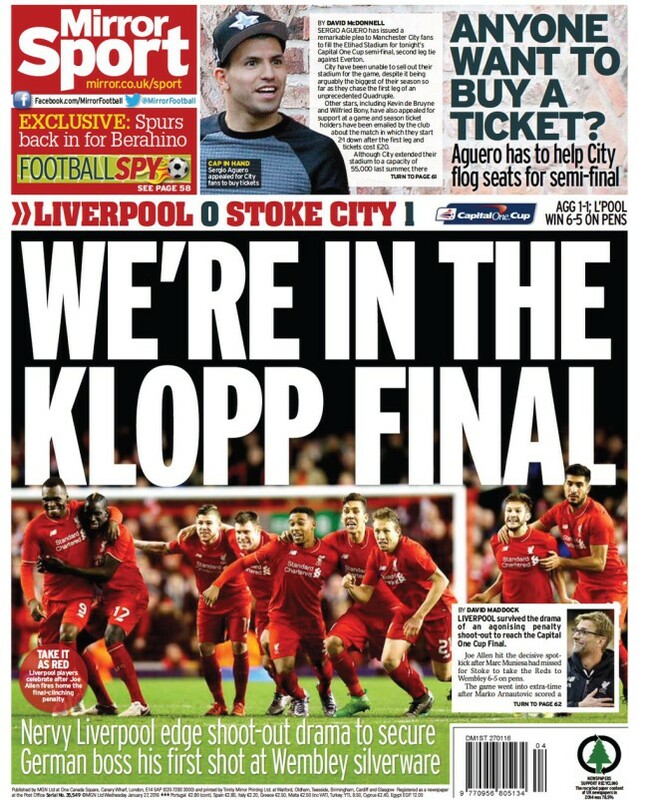 Liverpool have beaten Stoke city to reach the League Cup final. 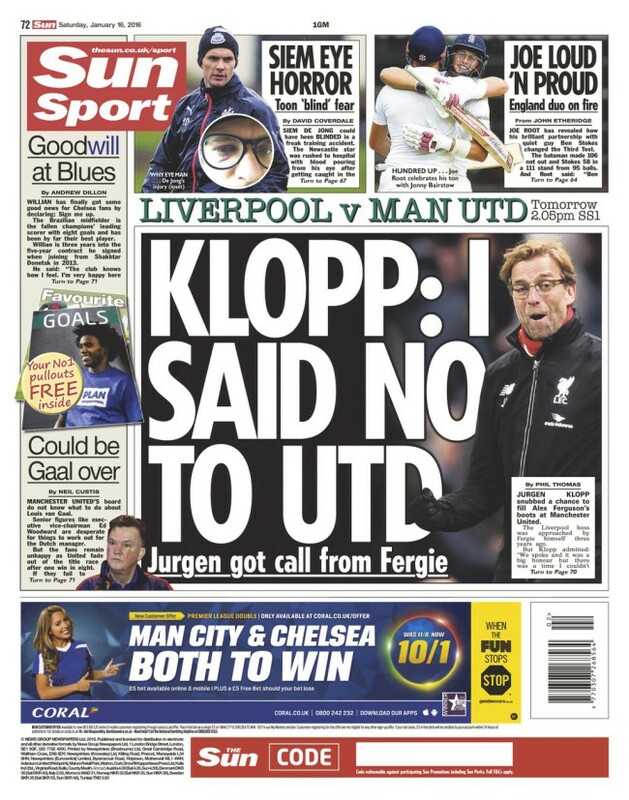 The papers will go mad for Jurgen Klopp. 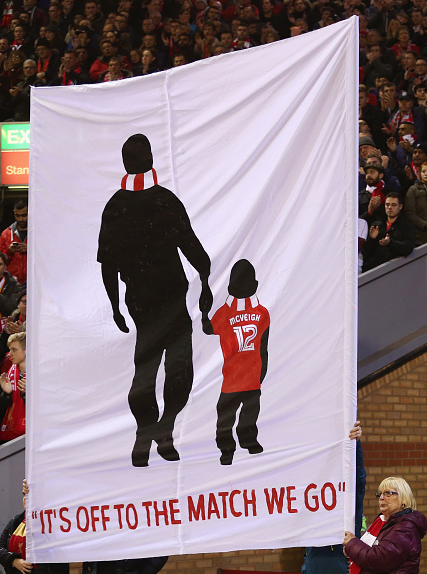 But Liverpool fans spared a thought for young Liverpool fan Owen McVeigh, an 11 year old who passed away last month after a battle with leukaemia. Paul Tisdale giving Jurgen Klopp a present before the start of FA Cup match between Exeter City and Liverpool “is just one one of the nicest things ever”, says George Caulkin. 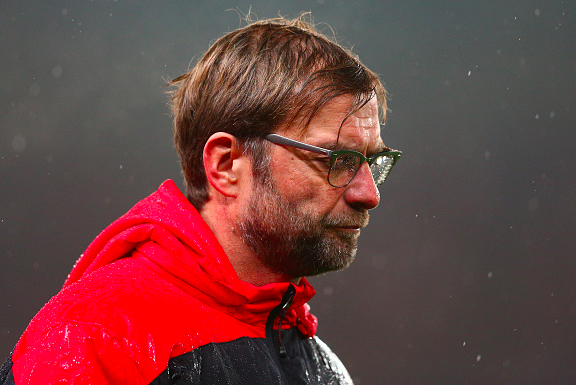 Liverpool manger Jurgen Klopp “may be forced into the transfer market”, reports the BBC. During Liverpool’s 1-0 League Cup semi-final first-leg win at Stoke, Philippe Coutinho and Dejan Lovren were forced from the field with hamstring injuries. At the final whistle, Kolo Toure looked to be struggling. 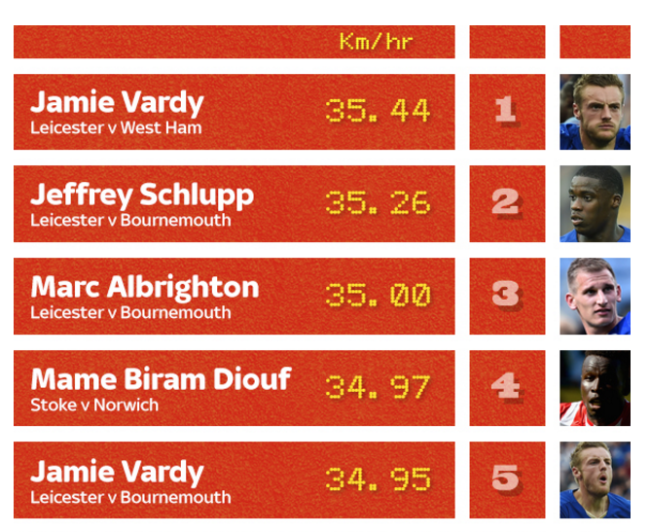 With Martin Skrtel already injured, Liverpool have no fit central defenders. 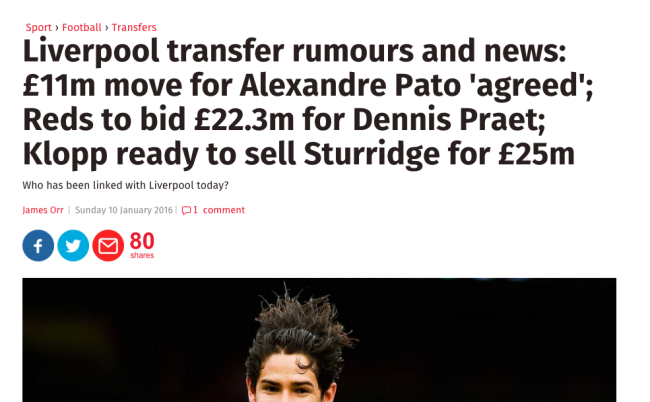 On the matter of what players Liverpool should buy, the Press is full of guessing. 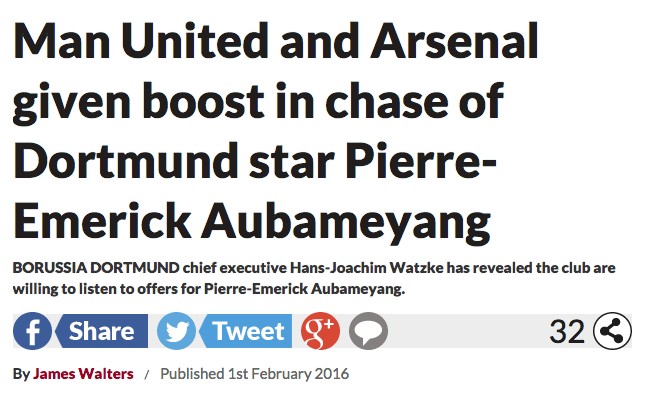 The Liverpool Echo links Liverpool to Ilkay Gundogan yesterday ,Pierre-Emerick Aubameyang, Joel Matip and Leroy Sane. 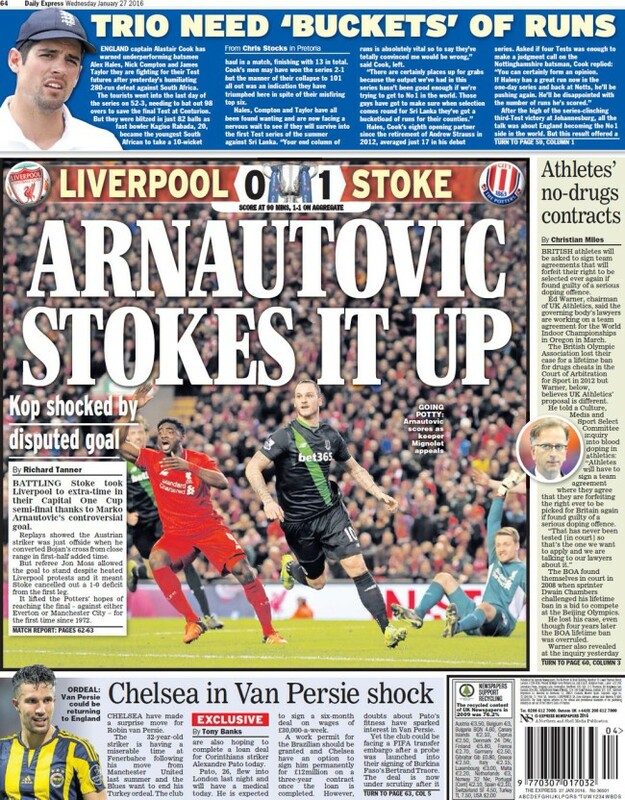 The Express says “Marko Grujic looks set to be unveiled as Jurgen Klopp’s first signing as Liverpool boss today”. 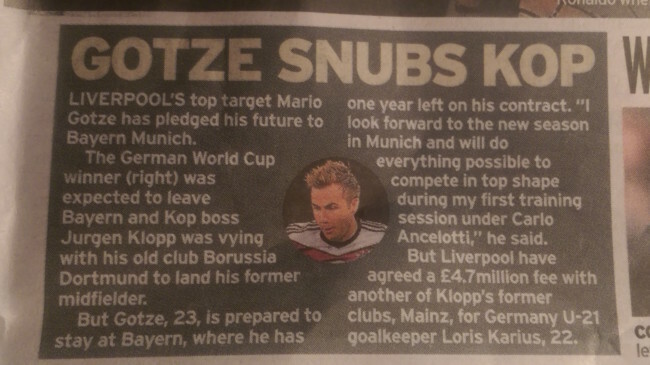 The Star says Toni Kroos is on his way to Anfield – maybe.